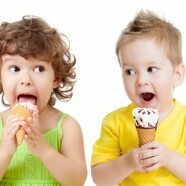 National Ice Cream Month: the perfect excuse to grab that chocolate dipped cone on a hot summer day. But while July might entice some to seek out the nearest DQ, others can get a guilt free ice cream fix by watching a few well-done ice cream advertisements! The classic story of distress to success is apparent in The Ice Cream Aisle, with the story’s protagonist being Blu, the bunny-ambassador for Blue Bunny. Blu can’t help but to have googly eyes to a grocery store freezer while starring up at his favorite ice cream: Bunny Tracks. Blu is mesmerized by a chocolatey, caramel vision… up until he gets pushed aside by a (human) consumer who snatches the ice cream of his dreams from the shelf. But still determined to unite with Bunny Tracks, the commercial ends with Blu moving across the checkout conveyer belt with Bunny Tracks by his side. Yes, there are happy endings even for ice cream craving bunnies. Cold Stone Creamery, on the other hand, produced a similarly enticing commercial, capitalizing on simplicity in the best way possible. Old and young couples smile and laugh as they eat their ice cream and children’s eyes become wide as they gaze upon the variety of flavors, all while employees can’t help but feel happy to serve such a warming, cool treat to guests. Not only does slow-motion ice cream scooping effects make consumers want to hop off their chair and head to Cold Stone, but it makes consumers want to enjoy their treat with loved ones (and sing along to Natalie Cole’s “This Will Be,” of course!). Ben & Jerry’s created a unique commercial earlier this year, too, creatively and thoughtfully announcing that non-dairy ice cream has arrived to their product line in Non-Dairy is Here!. Ben & Jerry’s goes above and beyond a simple announcement for this line, however, by tracing the process all the way back to their Consumer Affairs department to show just how in-demand non-dairy ice cream has been. “The Non-Dairy Queen” is shown hard at work, striving to appeal to the consumers’ pleas as a result. This thoughtful commercial and product alike truly keep the consumer in mind from start to finish. Whether it’s Blue Bunny, Cold Stone, Ben & Jerry’s, and more, get out and enjoy America’s favorite, mouth-watering treat during National Ice Cream Month! Elizabeth is a Junior Executive Intern at SJG. She earned her BA from the University of Wisconsin-Madison this past May. Outside the office, she enjoys bike riding, listening to music, and hanging with friends and family. Will Pop-Up Shops Overtake Traditional Retailing? © 2015 The San Jose Group Co. All Rights Reserved.